In imperial Rome spas were symbols of emancipation and prosperity, as well as a great example of architectural perfection and engineering skills thanks to their advanced water heating systems. Emperors vied to build greater spas than those of their predecessors, thus turning spas into veritable monuments of magnificent beauty. The cycle of baths began by entering the balneum, after they moved to the tepidarium, where they were anointed with oils and remained for about an hour. The calidarium and laconicum followed, finishing with a dive in the frigidarium to fully enjoy the benefits of the warm cold effect. At the end, refreshed and fragrant, the Romans moved into other areas of the spa, where they read, admired works of art and enjoyed social entertainment. QC Terme continues that Roman concept in its own centers, a place where you can enjoy timeless and unique emotions, as well as relaxing moments alone or in the company of others. They came to life in 1982 and presently runs nine wonderful wellness centers, marked by the elegance of their architecture, blending harmoniously with the latest technology to provide multi-sensory paths upon which to indulge in pleasant moments of complete relaxation. Opening a spa at Fiumicino just a few kilometres from Rome; thus bringing the spa back to its birth-place, the location where it all began. Wellness, history and nature are the main features of Termeroma, a country-chic 5-star resort and spa set in a natural frame of extraordinary value. The resort is located on Via Portuense, the road built at the end of the first century A.D. in order to connect the city of Rome with its ancient harbour, found at the mouth of the Tiber. The charm of history permeates every corner, thanks to its original architecture and its precious building materials, this Resort and Spa is able to bring back legends and traditions from the agricultural origins of the region that deserve to be told and remembered every day. To forget daily stress and enter into a world of relaxation, Termetorino is a true wellness oasis in the center of Turin. In the charming outside garden you can plunge into marvellous hydro-massage Jacuzzis of differing temperatures as well as sensory pool with underwater music. At places like these guests have the possibility to live authentically immersed in a captivating natural frame, to find themselves in contact with atmospheres and landscapes recreating the charm of yesteryear. On the other hand, if you find yourself exhausted after all-day exploration fashion capital of the world, in the center of Milan, at Termemilano you can enjoy in a multisensory journey with over 30 different wellbeing services. Resort is crowned with a large collection of massages to suit guests’ personal needs, conceived on the uniqueness of the person and tailored to meet the needs required, and rituals that allow you to rediscover the form, the balance between body and spirit and rediscover the pleasure of pampering yourself. 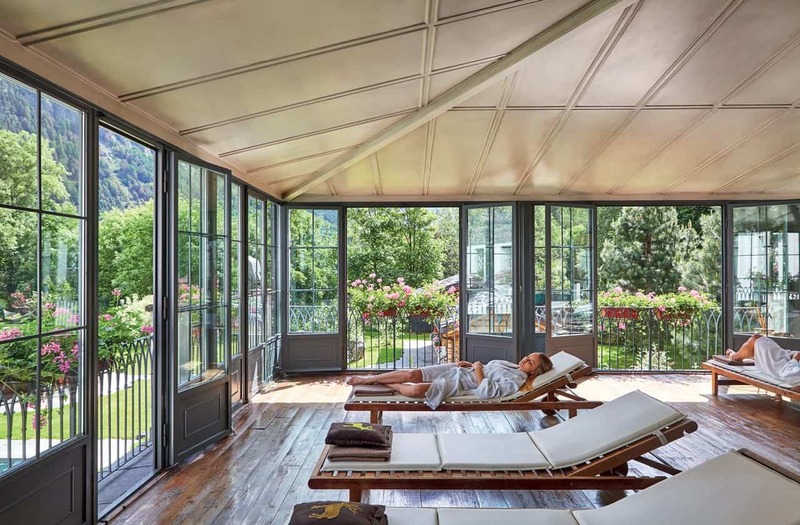 To counteract the effect of summer months and that heavy-leg feeling, Terme Pré Saint Didier with breathtaking views of the Mont Blanc mountain is the perfect location to fully restore oneself and enjoy a magical experience. Immerse yourself in the heat of the outdoor pools and enjoy exceptional views of stunning mountain peaks: the picturesque Giant’s Tooth and the majesty of Mont Blanc. Do not miss a warm open-air thermal bath under heavy snowfall in winter and by green mountain grass in summer. Continuing, one arrives at the Salt Room whose walls are entirely made of pink Himalayan salt bricks, recreating a marine microclimate. 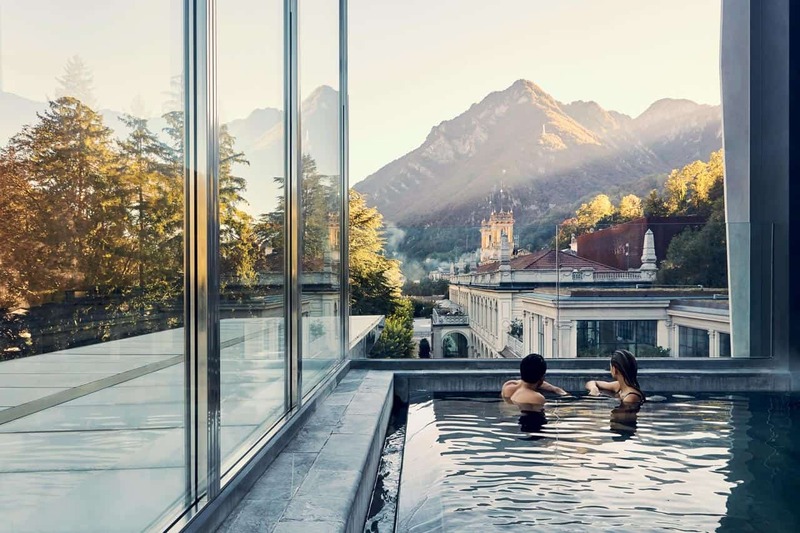 Situated on the banks of the Brembo river and surrounded by the Pre-Alpine hills of Orobie, San Pellegrino Terme offer guests unforgettable moments of joy, relaxation and gratification. Modern buildings and original structures harmonize effortlessly with fully restored frescoes, early 20th century ceilings and columns, and a fragrant boulevard lined of lime trees. The center of the complex overlooks the source of the most famous mineral springs in the world, where water is collected before being bottled and shipped out to prestigious restaurants around the world. 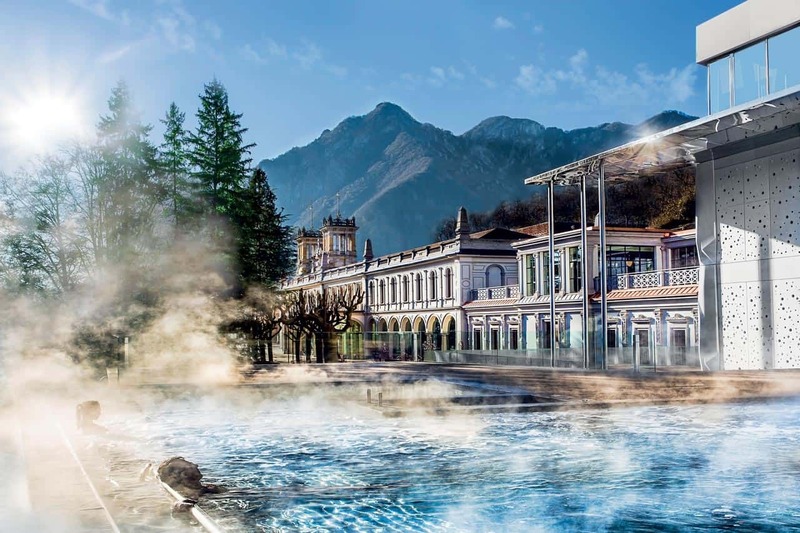 The thermal baths, however, have been built with water from the ‘Life’ source, which is rich in mineral salts, having several beneficial properties. Hot indoor and outdoor whirlpools, saunas, steam baths, relaxation rooms, massage areas and Kneipp trails, all linked together by imposing and elegant staircases, make of this building an exclusive place to absorb the ‘miraculous’ waters. Let yourself be enchanted with places like this and enjoy a unique holiday treated like emperors finding your inner peace.